Actual real-life 80 piece jigsaw puzzle purporting to come from 'Consolidated Useful Stuff' but actually coming from Boots. I only did five of these, as 'specials' to give to competitions and stuff that Hodder were doing. (In SA and Canada, apparently) Number one, which had an older style 'Constuff' logo, went to David and Yolanda Kusumoto in return for their donation to the Usk House Day Hospice. 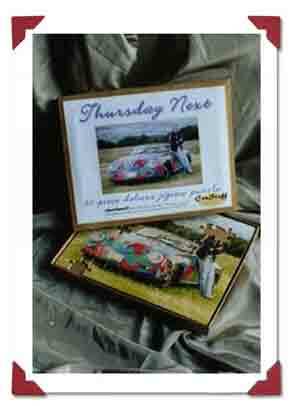 The puzzle of the 'Thursday-with-speedster' differs from the picture on the box in that the number plate and Thursday's face are not blurred - this was because Boots could only make puzzles from a negative. Missing pieces are missing from all editions in the same place. 5 editions only. Given out with TN-1, July-August 2001.